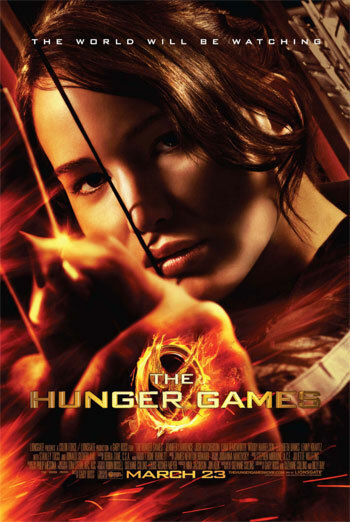 THE HUNGER GAMES is an adaptation of the first novel in the 'Hunger Games' trilogy by Suzanne Collins. The film is set in North America in the future where a totalitarian government requires an annual tribute from each section of the country. This tribute takes the form of a girl and boy who must compete in a televised 'hunger game' in which the participants are placed in a large outdoor environment that can be manipulated by the authorities. Only one competitor can survive and win the 'game', killing off their rivals if necessary, although it is also possible for competitors to die as a result of accidents or exposure. The film focusses on one participant in particular, Katniss Everdeen, who volunteers to be a tribute in place of her younger sister. A cut version of the film was originally classified '12A' for cinema release for intense threat, moderate violence and occasional gory moments. This 'International' version of the film restores the material that was cut for cinema release and has therefore been classified '15' for strong violence and threat. The BBFC's Guidelines at '12A'/'12' state 'Moderate violence is allowed but should not dwell on detail. There should be no emphasis on injuries or blood, but occasional gory moments may be permitted if justified by the context'. Once the competition begins, there are a number of sequences in which the participants fight against one another and there is sight of competitors being killed and injured. When the film was seen for advice, in an incomplete version, the BBFC informed the company that certain sequences placed an emphasis on blood and injuries that was unlikely to be acceptable at '12A'. Accordingly, four scenes of violence and one scene showing injuries were reduced by cuts and by the darkening of certain shots. When the finished version of the film was submitted for formal classification, four further cuts were required to remove some remaining sight of blood and injuries that breached the terms of the '12A'/'12' Guidelines. This version of the film reinstates the material that was cut for cinema release and is therefore more appropriately classified at '15' where 'Violence may be strong but should not dwell on the infliction of pain or injury'. The film also features scenes in which characters practice with, and later use, a variety of weapons, including bladed weapons and bows and arrows. The Guidelines at '12A'/'12' state 'Easily accessible weapons should not be glamorised'. When the film was seen for advice, in an incomplete version, the BBFC informed the company that one scene of knife threat in which a blade is sadistically held to a character's face, should be removed for the requested '12A'. That scene has been reinstated in this version and the film is therefore more appropriately classified at '15'. In terms of the other scenes that were present in the cinema version, there is no glamorisation of weapons, which are generally used by the 'bad' characters rather than by the heroes. The futuristic and fantastical setting further distances the use of weapons in THE HUNGER GAMES from the use of weapons in a credible real world setting. Inevitably given the narrative, there is a certain sense of threat hanging over the central characters from the start of the film. They know they will have to take part in an event that they may not survive. However, this underlying sense of threat is not realised until the second half of the film, in which the 'game' begins. Even when the 'game' commences, this sense of threat is broken up by other episodes and there is a strong emphasis placed on the ingenuity of the central character in hiding herself or working with other competitors in order to survive. The central character does not initiate violence and a clear distinction is made between the 'bad' characters who are prepared to use violence in order to win and the 'good' characters who avoid conflict. The sense of threat is further reduced by the developing relationship between Katniss and the other tribute from her sector, for whom she begins to develop feelings. We also see the development of a mutually supportive relationship between Katniss and another female competitor. The Guidelines at '12A'/'12' state 'Moderate physical and psychological threat may be permitted, provided disturbing sequences are not frequent or sustained'. The sequences of threat would have been permissible at '12', in line with the '12A' cinema version, given that the more threatening sequences are well broken up by other material and are not individually sustained. In one scene, the participants are attacked by wasp-like creatures that inject powerful hallucinogens into their victims. This results in Katniss experiencing hallucinations, which are vividly depicted. However, there is no deliberate use of drugs in the film. This work was originally seen for advice in an unfinished form. The company was advised that the film was likely to receive a '15' certificate but that their preferred '12A' classification could be achieved by making a number of cuts and visual reductions. When the finished version of the film was submitted for formal classification, cuts had been made in four scenes of violence and in one scene showing details of injuries. These reductions were implemented by a mixture of visual cuts, visual darkenings and the digital removal of sight of blood. In addition to the reductions already made during the 'advice' process, the Board required further reductions in one scene following formal submission of the finished feature (see cuts details above).